Mobility is something that most of us take for granted, yet an estimated one in fifty people live their lives with some kind of paralysis. This can be a side-effect from a medical condition. Or an accident that injures the brain or spine can dramatically change our ability to move. Regardless of the cause, the result is the same. The body cannot respond to the instructions it normally receives from the brain. This can fundamentally change a person's sense of identity. For some, paralysis can become a powerful new part of their persona but for others it strips them of their independence and the activities that helped define them. So can science help people re-discover their mobility? And what shape will the innovations take? Life with paralysis is more than just dealing with being unable to move. People with paralysis are also at greater risk from the health effects of being immobile, like diabetes and cardiovascular disease; these are the likely consequence of being unable to exercise properly. To keep going as far as physical movements are concerned, paralyzed persons must keep walking to boost physical conditions and self-confidence. REX is the world’s first hands-free, self-supporting, independently controlled, robotic walking device – designed specifically for wheelchair users. REX is a hands-free robotic mobility device for rehabilitation, designed for people with mobility impairments. Designed for people with mobility impairments, REX is completely self-supporting and rapidly adjustable for each user, opening up the rehabilitative benefits to a wide range of people. REX also limits the burden on the therapists during manual handling and reduces the amount of help required to assist patients who are undergoing standing therapy. Some examples of REX’s robotic devices are mentioned below; this may be useful for you. As published in Metro, a wheelchair-bound man took his first steps in two years with help from a robot suit which could offer hope to other paralysed patients. 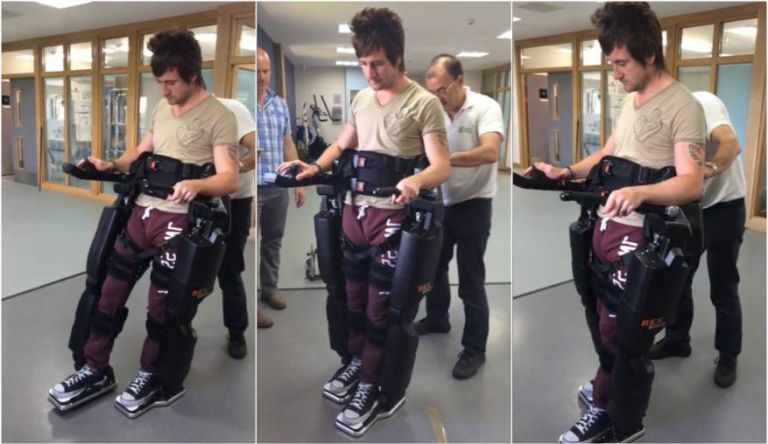 The makers of the £90,000 robotic suit claim that it can help paralysed patients avoid complications caused by extended periods of sitting still. Simon Kindleysides, 31, said, ‘I have been in a wheelchair since April 2013 when I was diagnosed with FND (Functional Neurologic ‘I was also diagnosed with a benign gloma brain tumour. I haven’t walked in over two years but thanks to PhysioFunction I was able to. 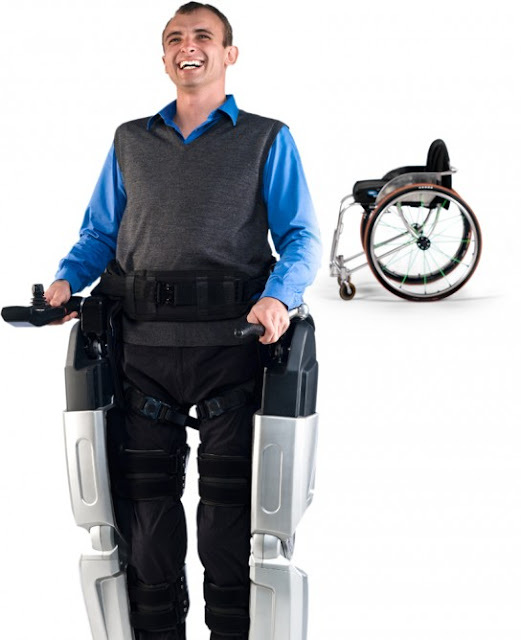 I used The Rex robotic suit which enabled me to walk, shuffle, turn and sit. 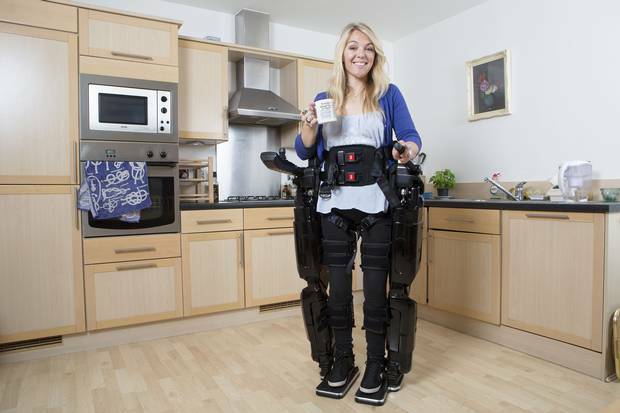 A high-tech exoskeleton is helping Sophie Morgan to walk again after 10 years in a wheelchair. She tells Susannah Butter that she thought this moment would only ever happen in her dreams. One of the first people to try REX is Hayden Allen, who suffered a spinal cord injury and became a full-time wheelchair user with doctors telling him he would never walk again. “I’ll never forget what it was like to see my feet walking under me the first time I used REX,” says Hayden, who is 6’4” (193cm) tall when standing. “People say to me, ‘look up when you’re walking’ but I just can’t stop staring down at my feet moving.” Allen can be seen using REX in the video below, and it’s hard to argue against the potential for the device when looking at the smile on his face. Wheelchair users are at risk of developing numerous medical complications from extended periods of sitting. By enabling them to spend more time standing, walking and exercising, REX may offer significant health benefits.